GE 105 - Chipping and shredding: The powerful electric shredder with chipping blades. Chipping and shredding: The powerful electric shredder with chipping blades. 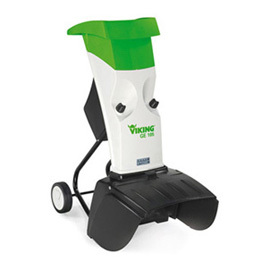 This electric shredder delivers abundant power, finely shredding branches and twigs up to approx. 35 mm in diameter. For this purpose, it is equipped with the versatile Multicut 103 blade system as well as two feed openings for branches with side shoots and soft shredding material. It is particularly suitable for producing mulching and composting material. When the chute is removed for maintenance, the electromechanical safety lock with large rotary switches prevents the machine from starting. The patented cloverleaf opening limits the possibility of material being forced back towards the user, whilst also protecting the user from accidentally coming into contact with the blades. Disc with three side profile teeth, reversible chipping blade, wing blade and aluminium counter-cutter which holds the branch for cutting.